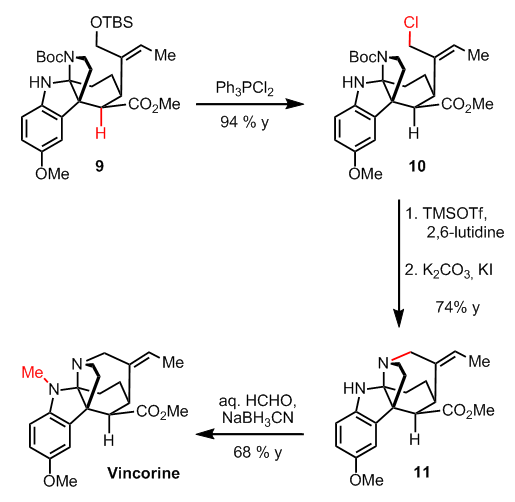 Vincorine is a rather young target for the synthetic community of which only a racemic synthesis has been published by the Qin group (J. Am. Chem. Soc., 2009, 131, 6013). 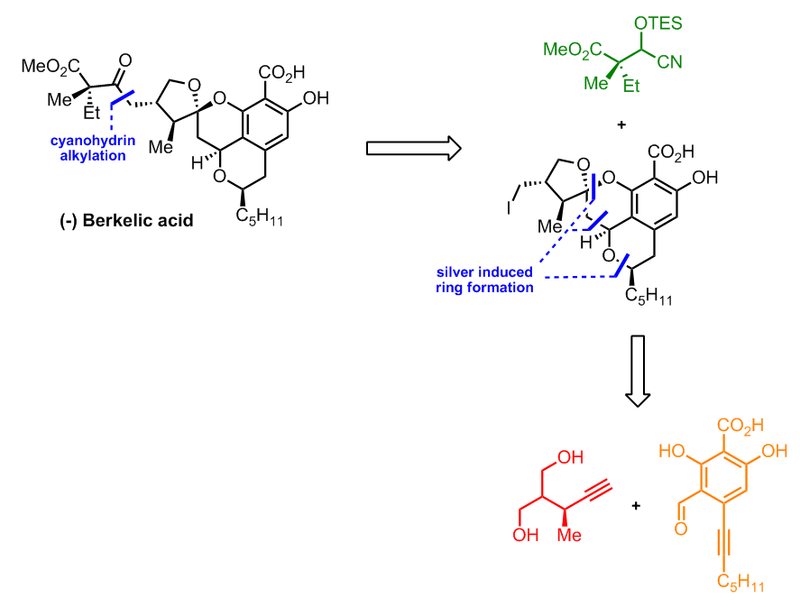 Besides vincorine the akuammiline alkaloid family contains several interesting members like strictamine, scholarisine and aspidophylline. 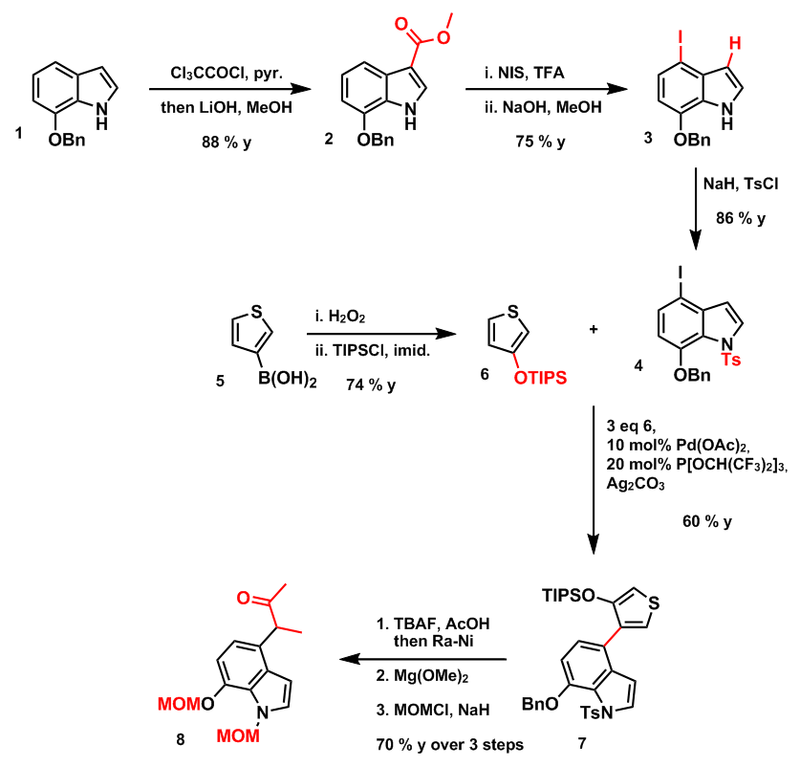 Total syntheses of most of the family members have been published within the last 20 years. 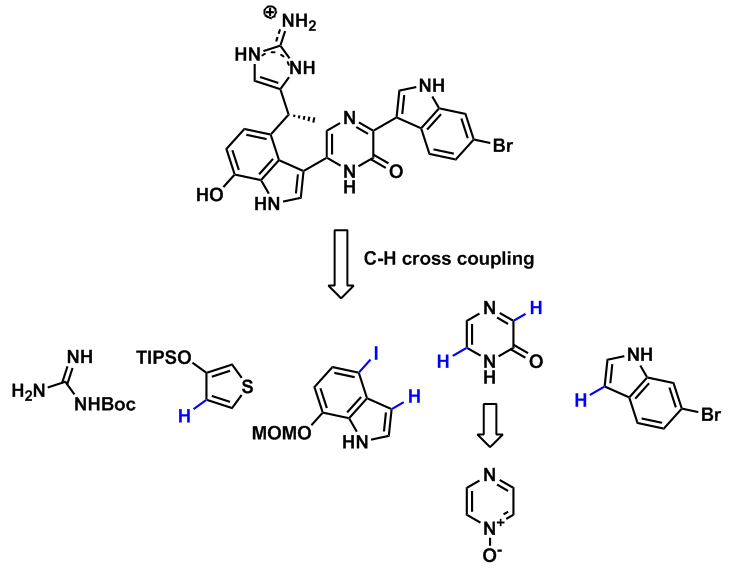 The group planned to access the crucial C-C bond marked in orange via an oxidative coupling. 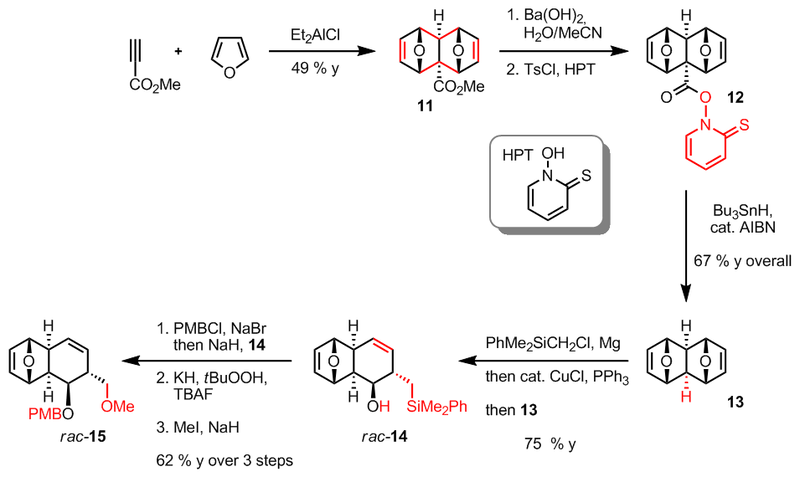 From the earlier synthesis of communisine A and B the group gained some experience with this kind of coupling reaction. 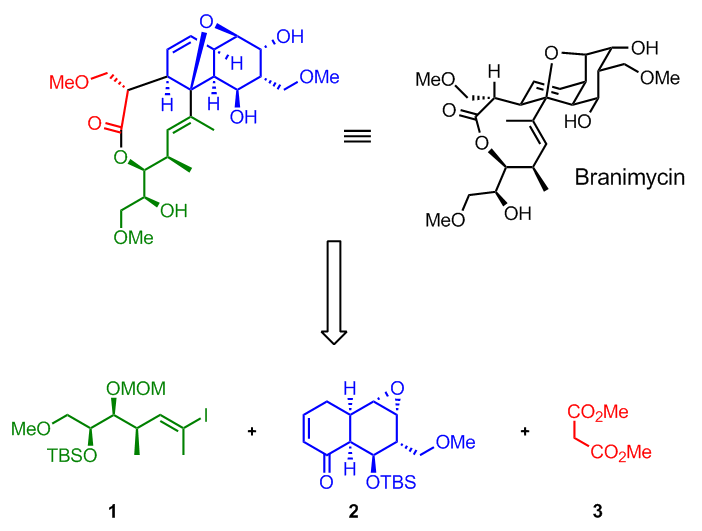 The remaining disconnections are straightforward leading to the key building blocks O-methyl-serotonin, a selenoaldehyde and ethyl acrylate. 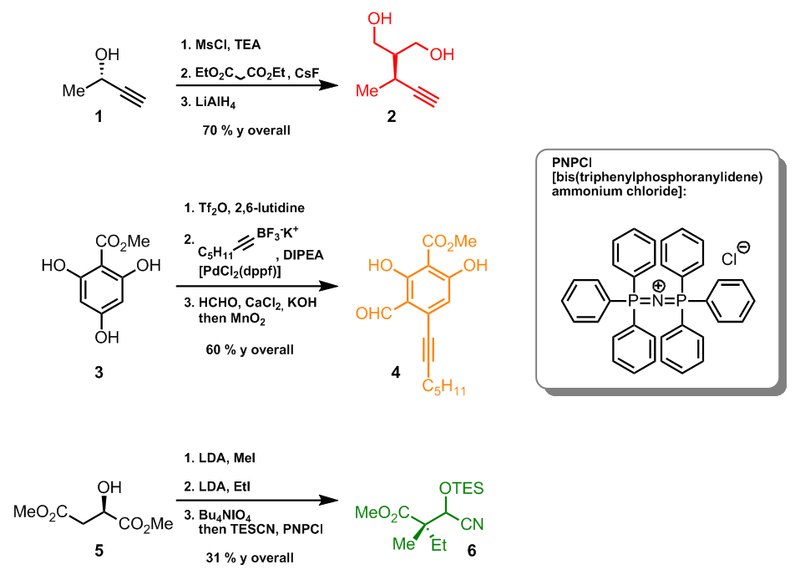 double bond and reduction of the ester gave alcohol 3 which was oxidized to the aldehyde and reacted with dimethyl malonate to give Michael acceptor 4. 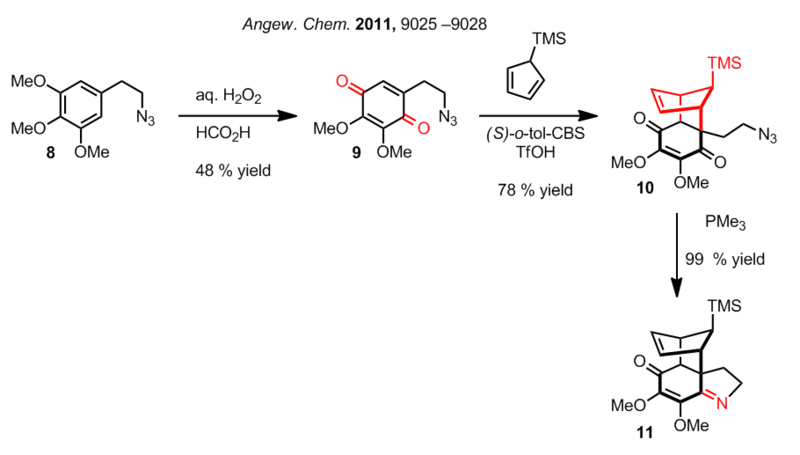 This was used in a highly stereoselective prolinol ether catalyzed Michael addition with the selenoaldehyde shown. 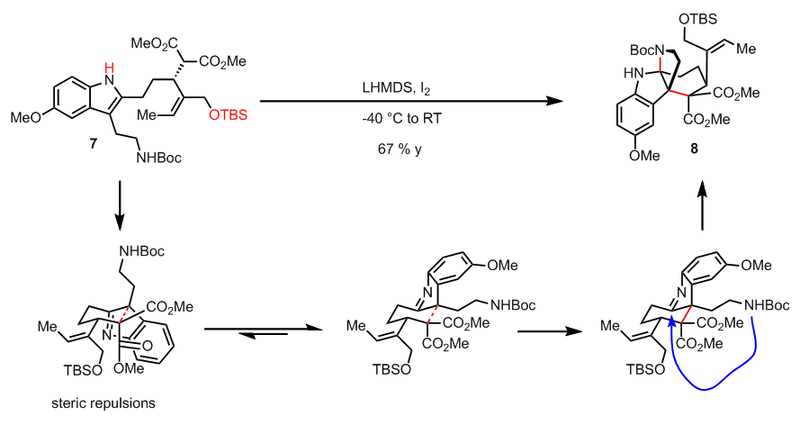 Oxidation and base induced elimination furnished an exo-methylene group which shifted under the reaction conditions into conjugation but with the wrong geometry. 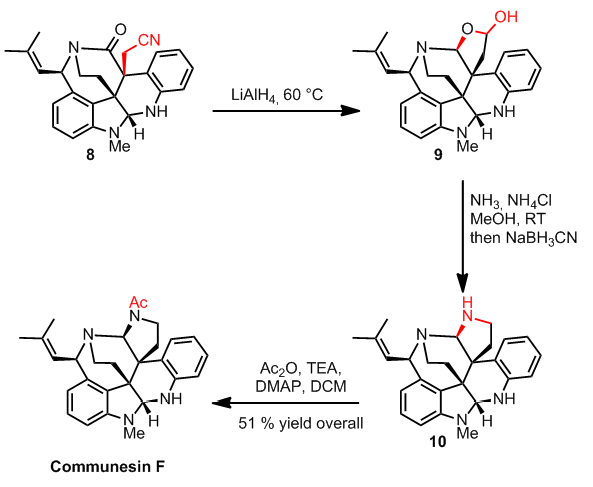 Under UV-light irradiation the cis-double bond was changed into trans-configuration yielding key intermediate 6 in almost quantitative yield. 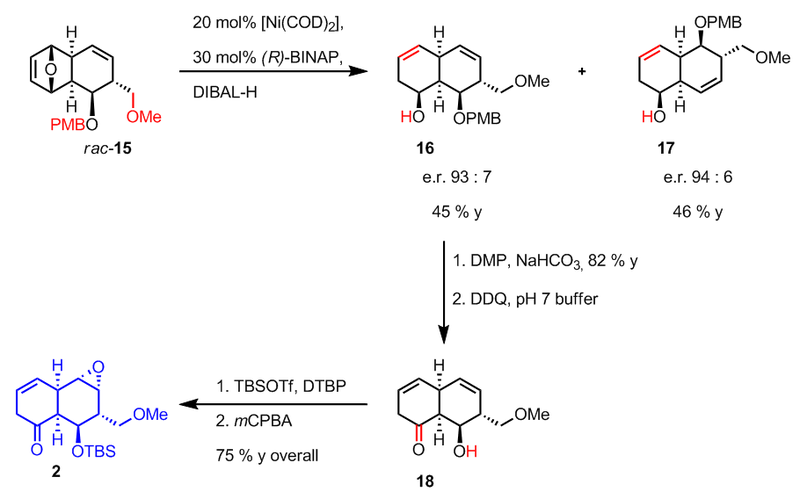 Going on with the synthesis the aldehyde was reduced, silylated, and the resulting ether heated on silica gel to remove selectively the indole Boc protecting group. 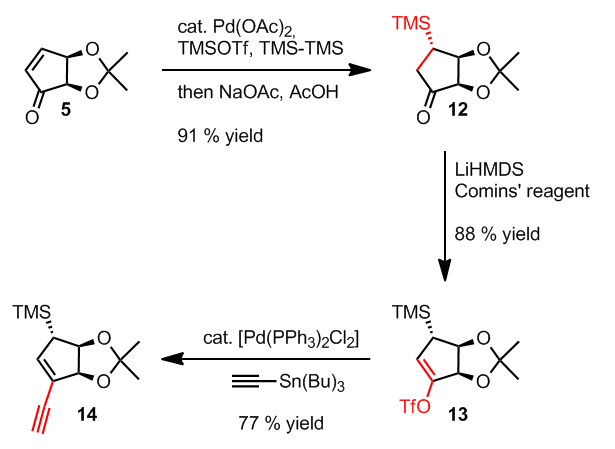 In the presence of 2 equivalents of LHMDS and 1 equivalent of iodine the group was able to perform an awesome coupling reaction giving them almost the whole framework in one single step. 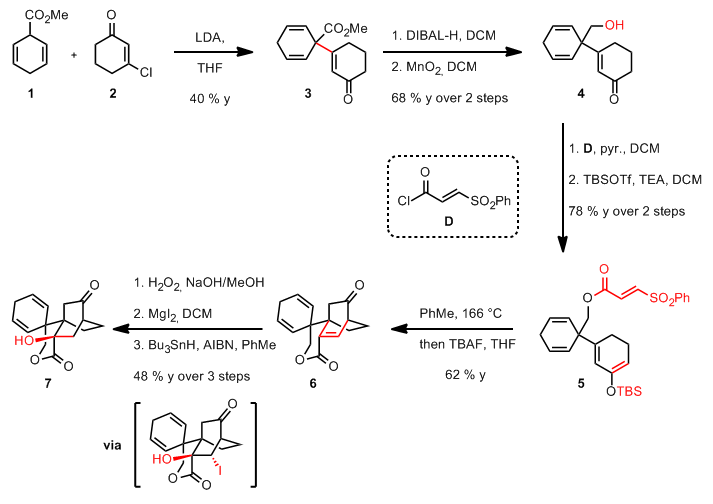 Finally the least hindered methyl ester was removed under Krapcho’s decarboxylation conditions. 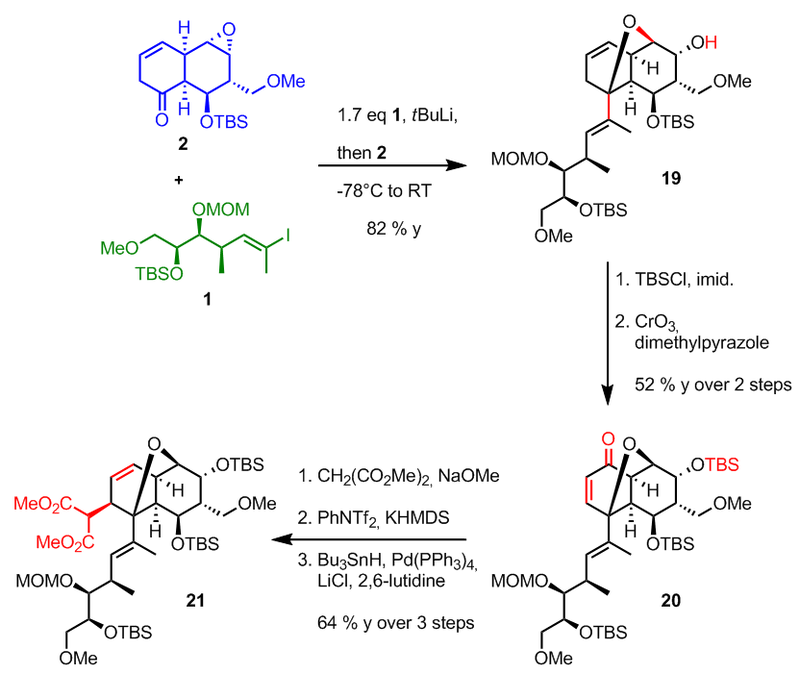 The last ring was closed after direct conversion of the TBS ether into allyl chloride 10, Boc-removal with TMSOTf, and intramolecular alkylation to give 11. 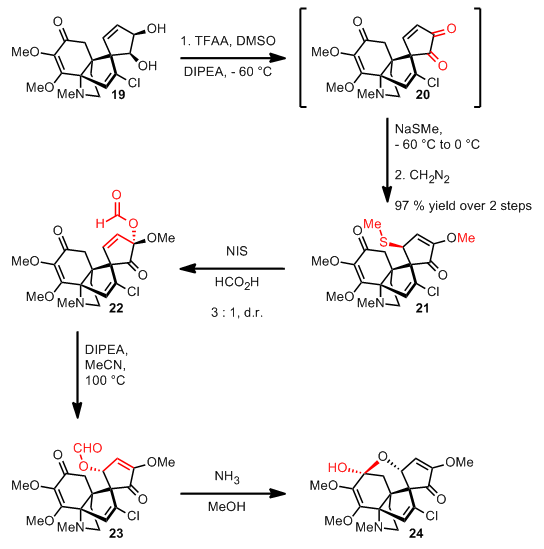 After reductive amination with formalin the group isolated (-)-Vincorine with an overall yield of 5 % over 18 steps in the longest linear sequence. 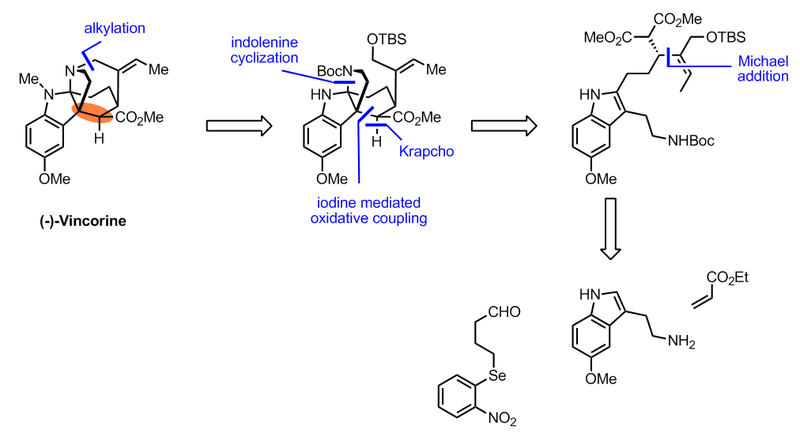 But how does the oxidative coupling work? 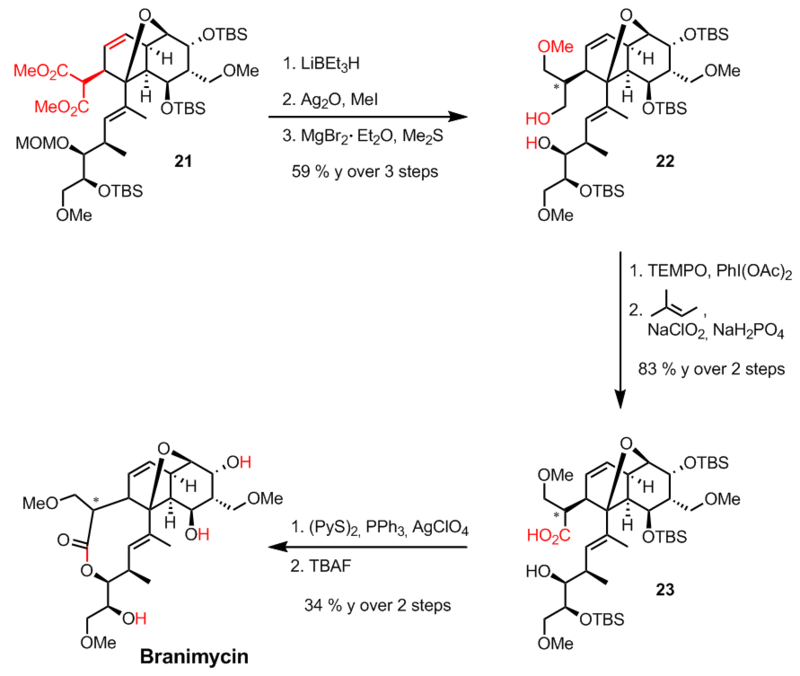 The authors state that it might work through a radical mechanism as proposed in their communesin A and B syntheses. 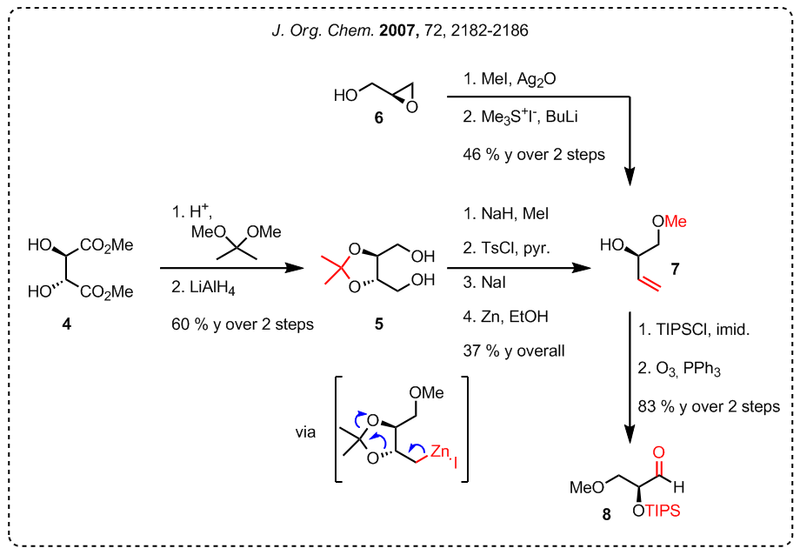 In the present publication no mechanism is given only some sort of transition state structure as is reproduced below. 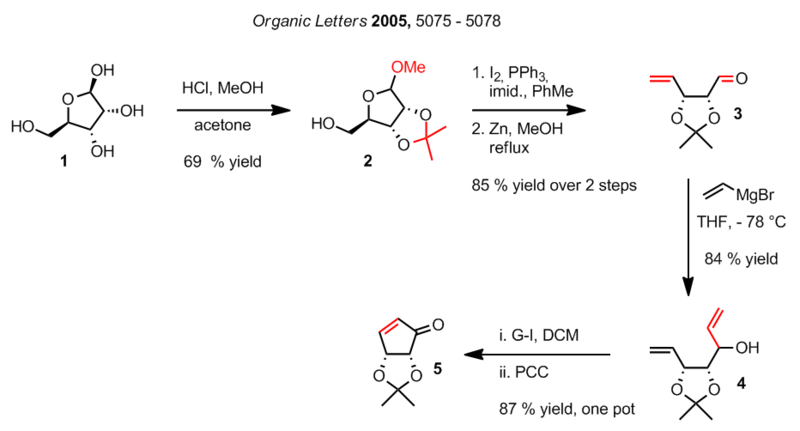 According to their postulation the doubly deprotonated starting material reacts through a Zimmermann-Traxler-like transition state stitching both ends together via intermediate radicals formed by two SET to iodine. In the last step the pyrrolidine ring is closed as usual. 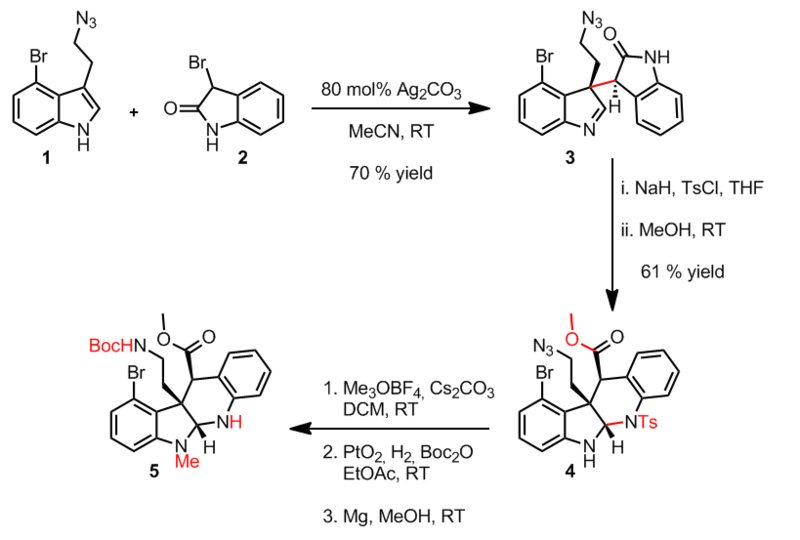 During a group meeting we discussed the mechanistic rationale behind this reaction and came up with a mechanism like that shown below which is better harmonized with the usual reactivity observed in halogenation reactions with indoles. 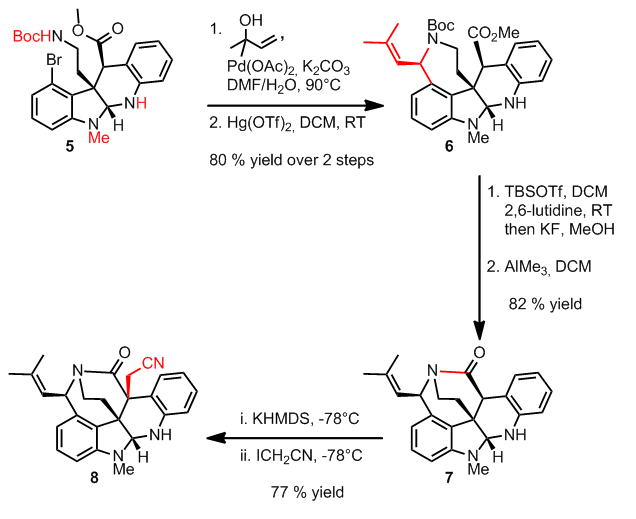 So after double deprotonation with LHMDS the indole 3-position is iodinated to form an indoline system which undergoes pyrrolo-indoline formation. 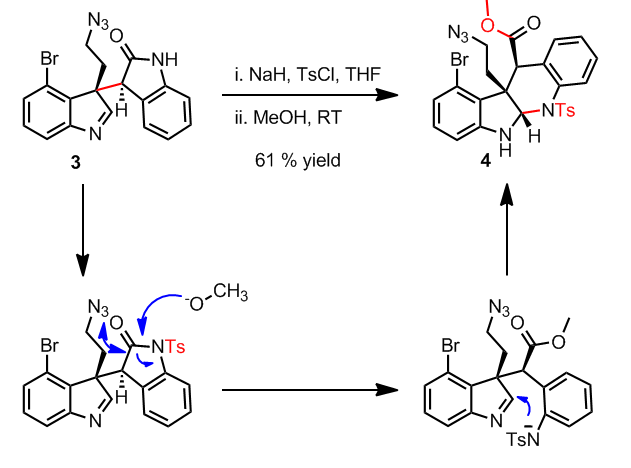 The former indole nitrogen can then kicks out the iodide through a SN2’-type reaction. 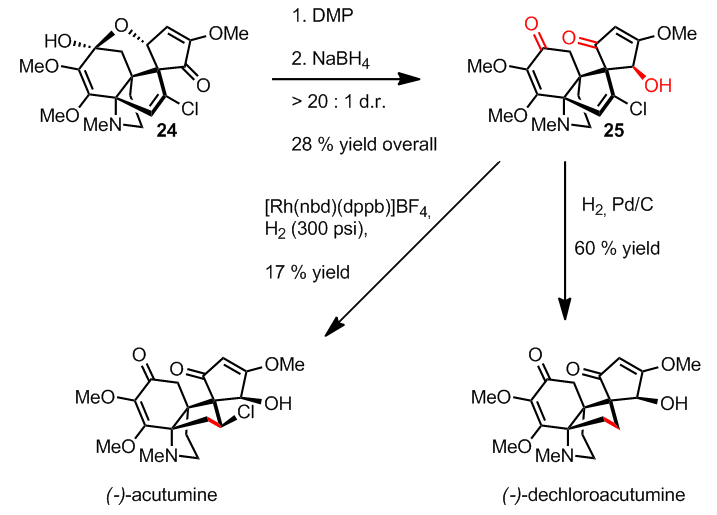 Now the malonate anion attacks the former 3-position of the indole and closes stereospecifically to give the expected product. 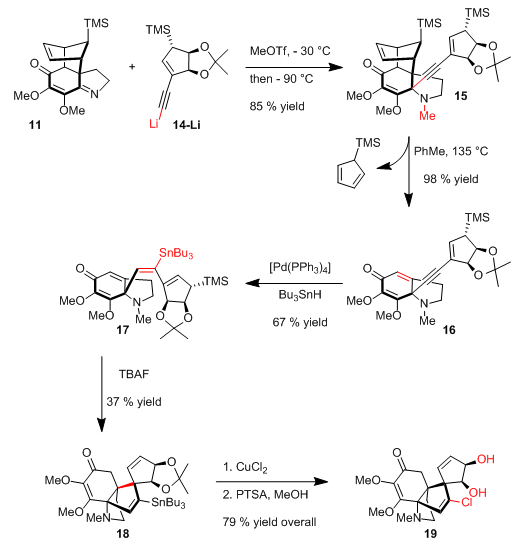 The obvious problem is the source of stereocontrol. 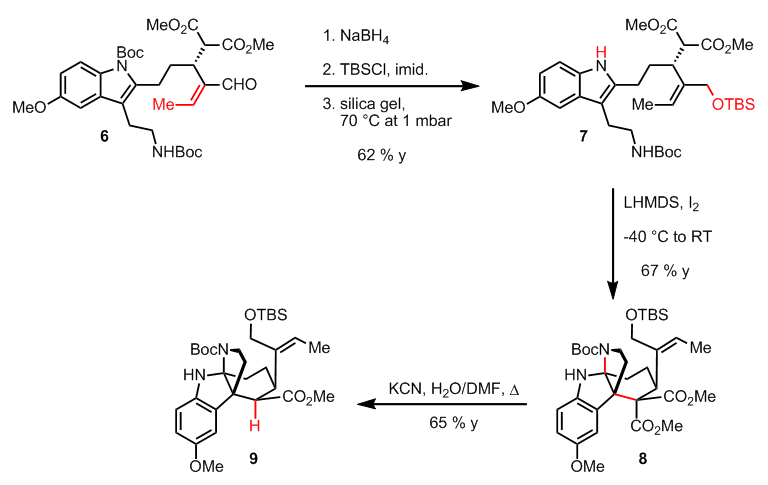 If you perform a minimization of the starting material then you will recognize that the unsaturated side chain with the bulky TBS group shields the upper face of the indole. 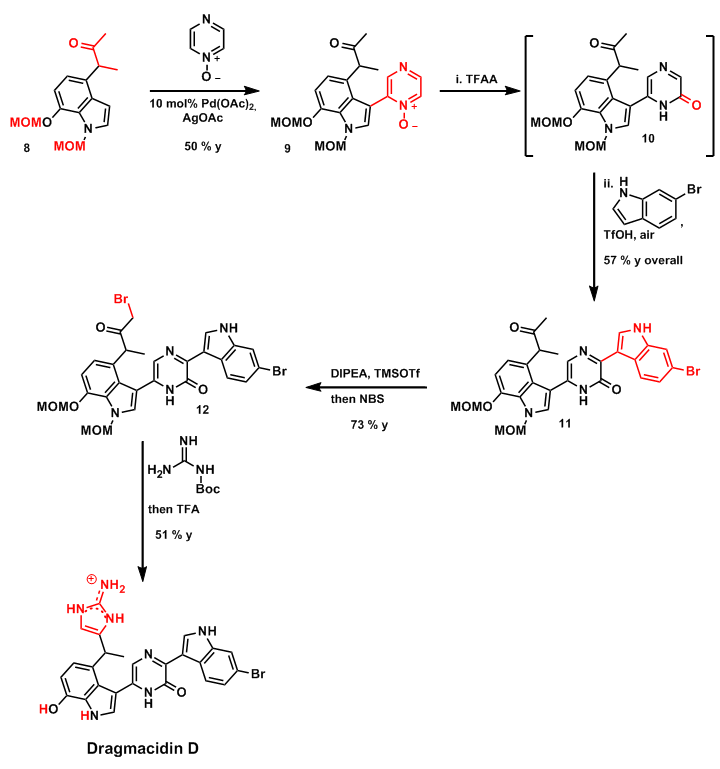 I would think that this bulkiness is responsible for the observed facial selectivity of the iodine addition. 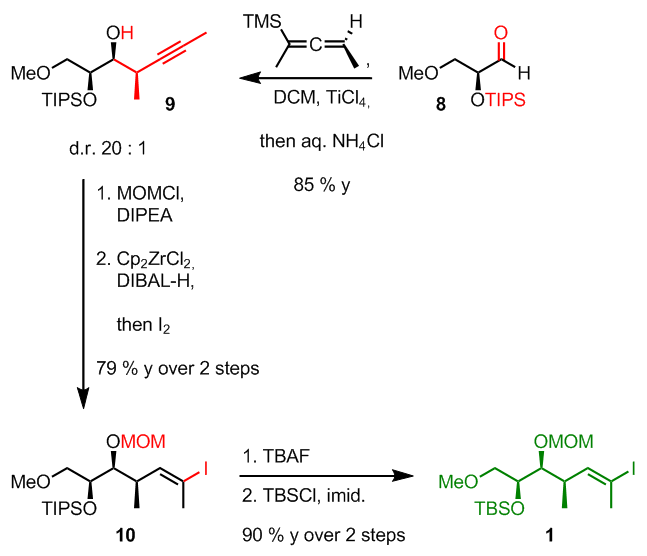 The remaining steps are now stereospecific and can only lead to the product. 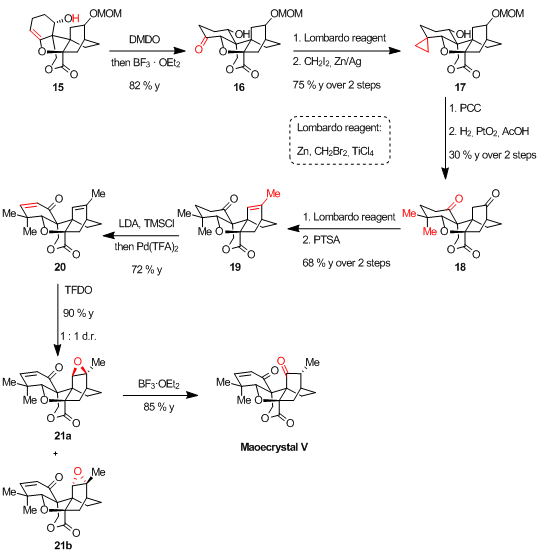 Or can someone offer me a better explanation with respect to the stereoselectivity observed? 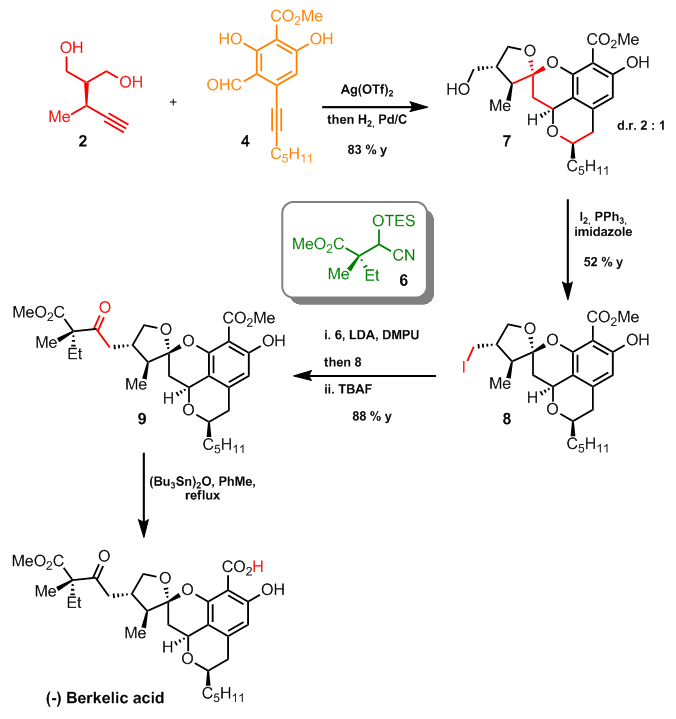 As Dave suggested a lithium aggregate might be respsonsible for the oberserved stereoselectivity of the iodine attack. 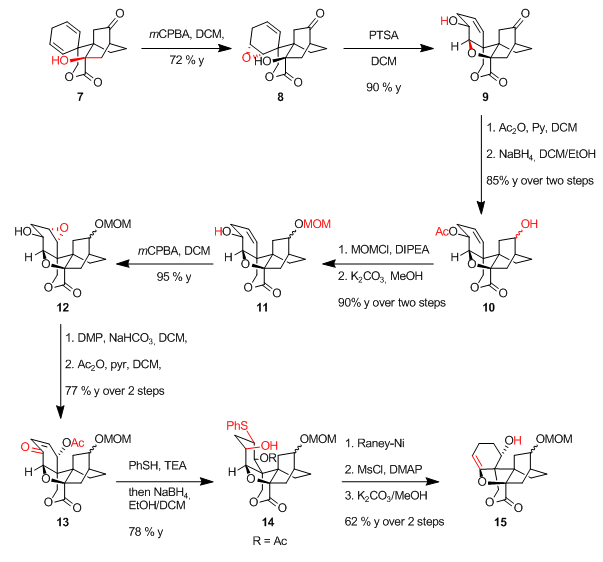 So I created the following 3D model and minimized it with ChemDraw. 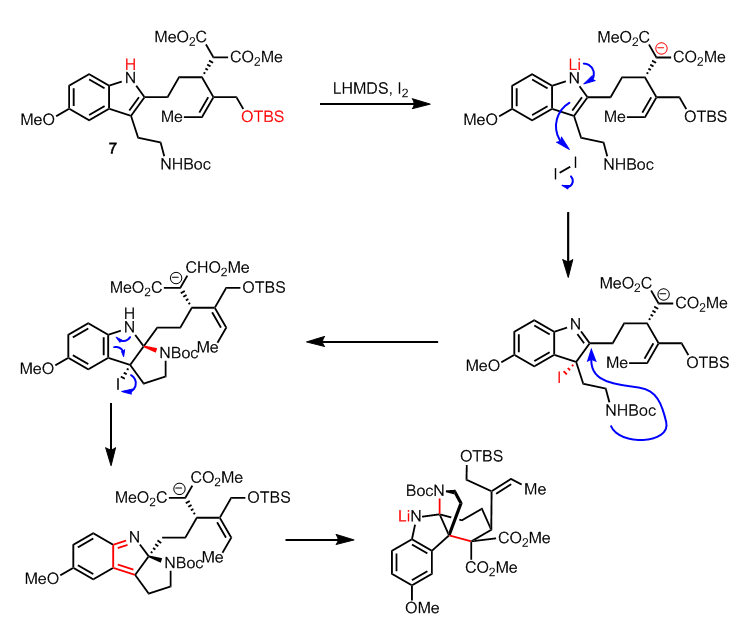 Given that lithium couples the enolate and the deprotonated indole nitrogen and is additionally coordinated by two THF molecules then you get this prediction. 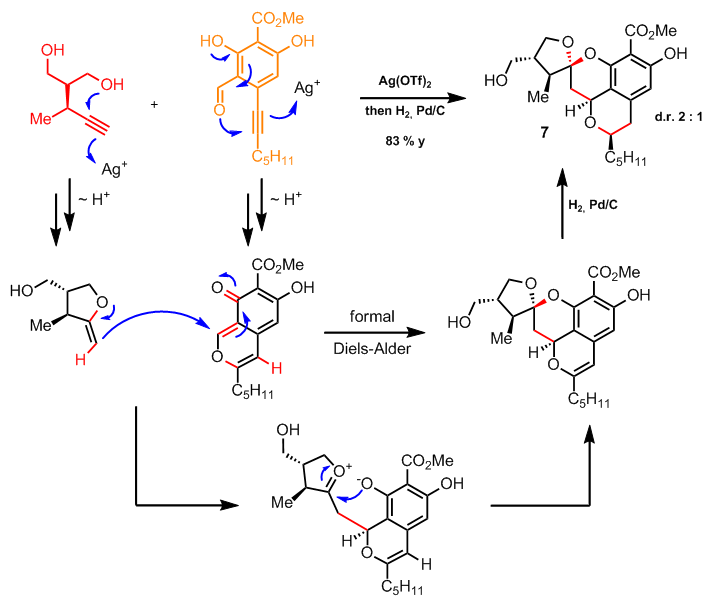 Maybe this offers another explanation for the observed stereoselectivity though I am still not satisfied with both models. Nevertheless big thanks for this suggestion. Big THX to Bobby for proofreading and questions.